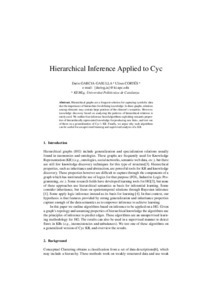 Garcia-Gasulla, D.; Cortes, C. Hierarchical inference applied to Cyc. A: Congrés Internacional de l’Associació Catalana d’Intel·ligència Artificial. "Artificial intelligence research and development : proceedings of the 16th International Conference of the Catalan Association for Artificial Intelligence". Vic: IOS PRESS-ECSC, BRUXELLES, 2013, p. 1-4.